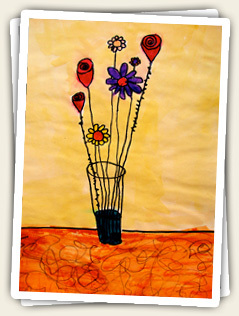 A floral bouquet helps Kindergarteners learn basic form, color, and balance. Many people think they are not artistic because they lack “innate talent” or “creativity.” Mt. Helix Academy’s award winning Visual Arts teacher, Ms. Stephanie Bedwell, contends that, with proper instruction, everyone can learn to create frame-worthy art. Moreover, she proves it year after year by organizing instruction so that her students acquire the necessary skills to create amazing pieces of visual art, and they acquire the confidence to do it. Mt. Helix Academy students are successful in our Visual Arts program because they are directly taught the skills they need to build a foundation of artistic competence and fluency. In our Visual Arts curriculum, students are also taught the language of art, including the essential elements and principles of design. Students are shown how art and culture are intertwined. As is characteristic of all teaching at Mt. Helix Academy, art assignments are analyzed into manageable steps that are designed to isolate concepts, teach specific techniques, and firm the associated vocabulary. With the fundamental skills in place, students are able to execute work that has dynamic composition, realistic imagery and space, and good craftsmanship. Our students also become fluent in the language of art, enabling them to evaluate art and express critical opinions. Children’s Hospital of San Diego has featured lobby installations of artwork by our students and visitors to our school regularly comment on the extraordinary art that is displayed in our rooms and our corridors. Artsonia, the online museum of student art, awarded Mt. Helix Academy fourth place among all California schools that display their artwork on their site.